A strong and tough defender who quickly become a fan favourite during his stay at Victoria Park, highlighted by his key role in the 1990 premiership. Kelly, universally known as ‘Ned’, was recruited from South Australian club Norwood and was a recognised leader around the club during his 122-game career, often playing above his height in the back pocket. His father, Kim, played 50 games for the Port Adelaide Magpies and his mother was a swimmer of international standard. With Norwood, he played at centre half-forward as well as in defence and learned his football in 121 games under the coaching of Neil Balme. He delayed moving to Victoria for two years after being drafted, initially because Balme didn’t consider he was ready for League football and later because he had surgery on both groins. 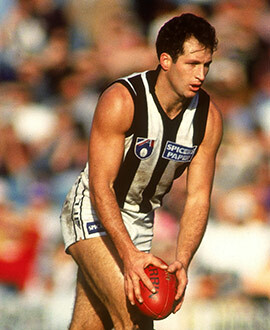 His straight-ahead play at centre half-back was a key factor in the airtight defence of Collingwood’s premiership team in 1990, and he was one of the several players reported during the infamous quarter-time brawl in the decider against the Bombers. In mid-1992, Kelly tore the hamstring from the bone and damaged anterior, posterior and lateral ligaments in his knee. Those injuries put him out of the game for 10 months. It was also in 1992 that Kelly drew ire for his collision with Sydney’s Ben Doolan, an action that caused many of Doolan’s teeth to fall out. He was the subject of controversy in 1994 when he pinched Hawthorn full forward Jason Dunstall as a defensive tactic during a game. The action had been in response to teammate Sav Rocca saying in a team meeting that Kelly had lost his “edge”. Kelly promptly tried the tactic on Rocca in a match-practice session during the week at Victoria Park and realised it would be irritating to opposition forwards. “Ned” was a popular figure throughout his career at Victoria Park and retired in a blaze of glory alongside Alan Richardson, with the pair bowing out in front of the adoring Victoria Park crowd in a 49-point win over the Brisbane Bears in round 22, 1996. Once retired, Kelly became a highly respected player agent, as well as acting as a guest panelist during the early years of The Footy Show. His son, Jake, would play a handful of games for the club’s VFL team in 2013 before being added to Adelaide’s rookie list.